In my search for a dissertation topic (starting point: Anglo-Saxon prose), I am increasingly interested in exchanges among Anglo-Saxons and their North Sea neighbors. My new line of inquiry comes as one of many in a series of summer novelties. 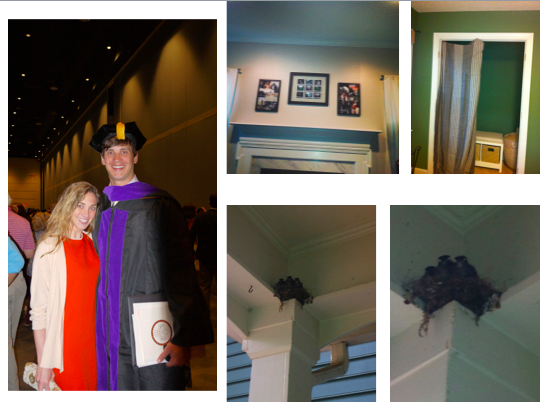 Two different batches of baby birds hatched in our stoop; Drew graduated from law school (summa, 1st in his class, tons of awards); I’ve engaged in some small projects around the house. 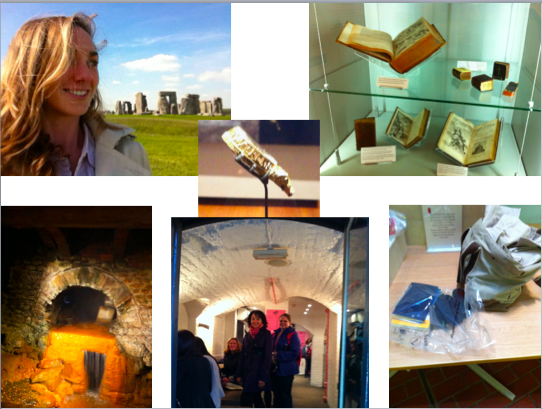 I also spent two weeks in London with librarians. My favorite firsts include seeing Stonehenge, the Alfred Stone, Oxford University Press, Bath, cave-crepes, and a tenth-century manuscript that I HELD WITH MY OWN TWO HANDS. After eleven straight weekends of travel, I was finally able to start my research in earnest. Once I realized that my interests were beginning to shift, I started with Haywood’s Dark Age Naval Power and Unger’s The Ship in the Medieval Economy, 600-1600. Chapter 3, “Anglo-Saxon Piracy and the Migrations to Britain” was the most useful of Haywood’s chapters to my research. It introduced me to the Litus Saxonicum, a series of Roman coastal defenses along both sides of the channel. If only I’d picked this book up a few months earlier! I’ve missed the submission deadline for BABEL‘s 2014 “On the Coast”meeting in Santa Barbara, but I’m encouraged that shoreline studies are now on the cutting-edge (HA. get it? edge?). Aaaaanyway, after the Romans withdrew from Britain in 410, Saxon raids increased. A note on vocabulary here– at this point in the story, no one’s a Viking yet. 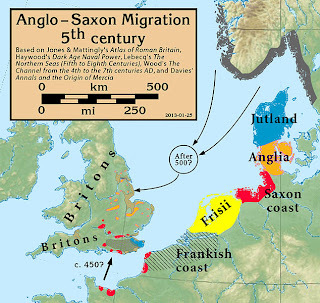 Britons were native to the island; Angles, Saxons, Jutes, and Frisians were invaders. According to Haywood, archeological evidence suggests that the Anglo-Saxon settlements came in two waves: “the first began in the early fifth century and was confined mainly to eastern Britain and was confined mainly to eastern Britain between the Humber and the Thames”and the second, spanning the middle of the fifth century and the start of the sixth, included “Kent and the south coast” as well as “the Midlands from East Anglia” (80). Haywood reads in the Anglo-Saxon Chronicle that, “the Anglo-Saxons who came to Britain after the mid-fifth century, such as Cerdic in Wessex or Aelle in Sussex, did not arive as either pirates or federates but as seaborne conquerors” (83). If those names seem at all familiar (and you’re not a medievalist), that’s totally legit. 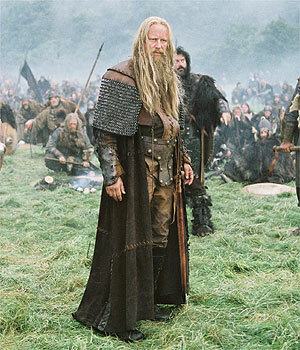 Here’s where you’ve heard them before: Cerdic is portrayed the previously blogged-about King Arthur (left). 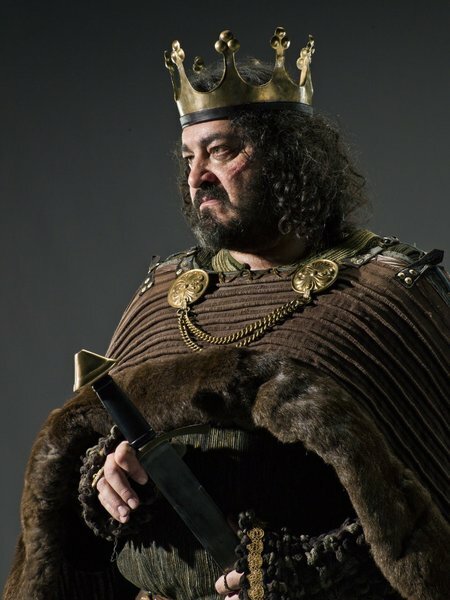 King Aelle(a) is a character on the TOTALLY AWESOME History Channel series, Vikings (right). Ok, so, back to the scholarship. After briefly discussing the literary accounts of the 5th century invasions (Gildas, Bede, Gallic Chronicles, Anglo-Saxon Chronicles), Haywood reminds us that the Saxon raiders did not limit themselves to Briton–they raided in Gaul as late as the seventh century (though by now they’re starting from Britain as opposed to Saxony). Next he goes through the development of shipbuilding by the Angles and Saxons, showing that “by the second half of the seventh century we can be quite certain that the sail was in everyday use by the Anglo-Saxons” (107). Note his use of Anglo-Saxon here. By now, this can refer to Angles and Saxons living in Britain. You’re rightly wondering, “where the ___ are the Vikings in this damn post?” Never fear, readers–they arrive just when you don’t expect them [kidding; see below]. 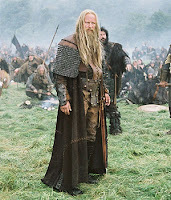 The beginning of the Viking Age is marked by most at 789, when Scandinavians came to Portland and were mistakenly identified as merchants by an ill-fated reeve. The reason I included all this background is because in a grossly-over-simplified version of reality, the Vikings did to the Anglo-Saxons what the Angles and Saxons had done to the Britons. 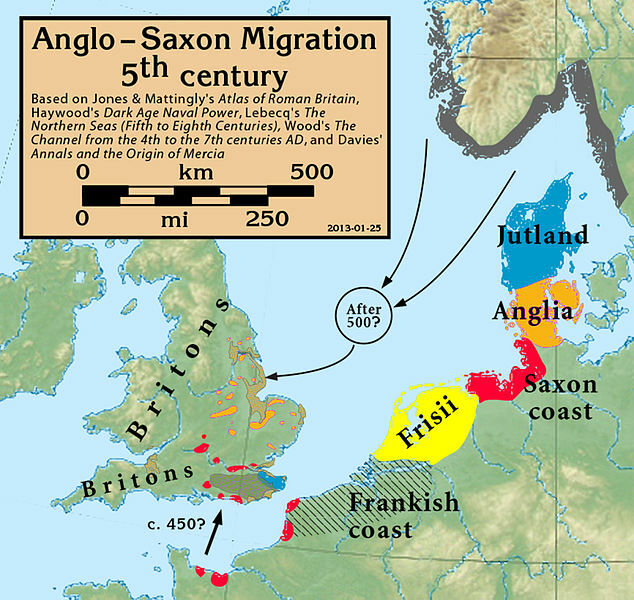 Just as Angles and Saxons came to Britain in raiding parties and eventually settled, so the Vikings (mostly Norse and Danish) arrived– at first as pillagers and then, as we can see from place-names, genealogies, genetics, archaeology, history, laws, and literature, as settlers in increasingly important ports. In case you’ve fallen into the “meh, I don’t really care about that” trap, check out McGlashan’s 2003 article about the Vikings’ generous beach laws, which I found in a perfectly-timed tweet by Medievalists.net. Despite Haywood’s detailed coverage of pre-Viking shipbuilding, Unger’s analysis of shipbuilding technology and its economic impact in his chapter on “Vikings and Byzantines: 750-1000” is surprisingly engaging (and I think better researched). Unger traces the development of vessels within the context of technological, military, and economic changes. He shows us that “[t]he development of the Viking ship was the most important change in European ship design from 750 to 1000″because it “marked a significant improvement in the ability to move people” (Unger, 80-81). And these people, in turn, went south to Iberia and through the Mediterranean to Alexandria; east to the Black and Caspian Seas; and west to Iceland, Greenland, and Canada. 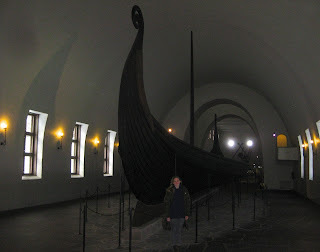 The new Viking ships were stable, deep-seaworthy, and light enough to carry on small stretches of land (82). And how do we know this? Because we still have some. 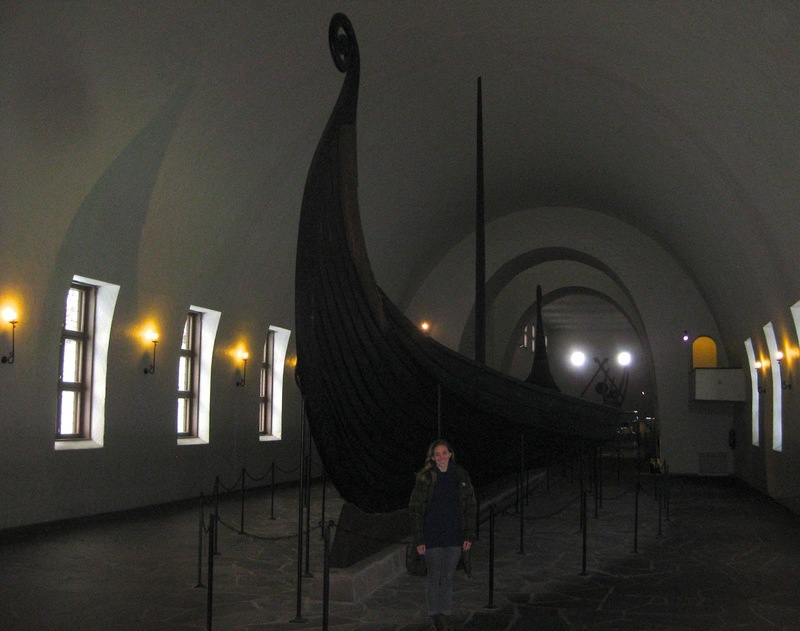 You can see a few at Oslo’s Viking Ship Museum, whose gift shop boasts such gems as Terry Jones’s children’s book and slides of the exhibits. SLIDES. So you see, Vikings were able to conquer and settle; they drew new boundaries on land and carved new “whale-roads” at sea. Awesome, am I right? My next book to read (and already the prologue was hard to put down) is Studies in the Medieval Atlantic, whose image I posted yesterday to facebook and Instagram. I hope to include it in a shorter post soon, but I’ll leave that for another day when I can give it the attention and space it deserves. Until next time, wishing everyone the blessings of newness (and no threats of invasion). Haywood, John. 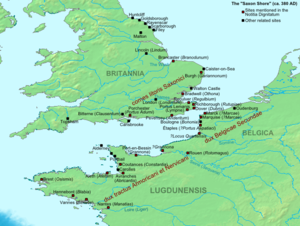 Dark Age Naval Power: A Reassessment of Frankish and Anglo-Saxon Seafaring Activity. Routledge, 1999. Unger, Richard W. The Ship in Medieval Economy 600-1600. London, 1980.